Hundreds of construction workers are killed every year from ladders and scaffolds, and many thousand more suffer serious injuries that are permanently disabling. And it is estimated that more than 30% of workers compensation claims costs stemming from construction sites are the result of falls from elevated surfaces. A recent study indicated that injuries related to falls from elevated surfaces are more severe than other injury claims because these accidents result in more time away from work, damage to multiple body parts, and more short- and long-term disability leave. A worker, who was standing on the top of a stepladder, fell when the ladder shifted. He suffered a spinal injury and was out of work for four months. Another worker failed to secure an extension ladder at the top and fell 20 feet when the ladder slipped away from the wall. Two men were working high up in a building atrium when their scaffold collapsed. They plunged four stories to a concrete deck. One man was dead on arrival at the hospital; the other was in critical condition. When a three-story wooden scaffold collapsed, two workers fell to the ground, suffering serious neck and back injuries. A third man working under the scaffolding was also injured. The Florida Office of Insurance Regulation announced that it has approved a rate decrease for workers’ compensation insurance in Florida. The 1.8% decrease was filed by the National Council on Compensation Insurance (NCCI) in a law-only filing resulting from the effects of the Federal Tax Cuts and Jobs Act. This applies to both new and renewal workers’ compensation insurance policies effective in Florida on or after June 1, 2018. For more information about the filing, read the official release from the Florida Office of Insurance Regulation. What Does Florida’s New Medical Marijuana Law Mean for Your Drug-Free Workplace? Last June, Gov. Rick Scott signed a bill into law that explains how patients can receive medical marijuana under Florida’s related amendment from 2016. Amendment 2, Florida’s “medical marijuana law” passed with 71% of the vote and took effect January 3, 2017. The amendment required lawmakers to come up with a description of how patients can qualify and receive medical marijuana by July 3, 2017. As an employer or employee in Florida, here’s what the new marijuana laws mean for you. While court challenges may arise, employers are generally safe since the law doesn’t require accommodation for medical marijuana users.The medical marijuana amendment to Florida’s law still preserves employers’ rights to enforce drug-free workplace policies. Despite patients being able to legally qualify and receive medical marijuana, if their employer enforces a drug-free environment, the patient won’t be able to work. The amendment does not limit an employer’s ability to “establish, continue, or enforce a drug-free policy.” It does not make it mandatory for employers to accommodate patients receiving medical marijuana or working under the influence of marijuana. The section also states that it does not “create a cause of action against an employer for discrimination or wrongful discharge.” Since the passing of the amendment in Florida, employers have worried about what it could mean for drug use in the workplace. Until courts rule otherwise, companies must not tolerate testing positive for marijuana under the drug-free workplace. According to the new medical marijuana law, patients must have a “qualifying condition” to receive medical marijuana. Conditions include cancer, Crohn’s disease, epilepsy, HIV/AIDS, Parkinson’s disease, post-traumatic stress disorder, seizures, and terminal illness. Since the passing of the new law, employers and employees have wondered what it might mean for drug use in the workplace. The answer? Not much, thanks to the section not granting employees the right to use marijuana at work if an employer has a policy against it. If an employee qualifies for legal marijuana use, he or she must still obey an employer’s rules for using drugs at work or having marijuana in the system. If an employer wishes to maintain or implement drug testing rules prior to hiring an employee, he or she has this right. Under current statutory and case law, an employee that does not pass the drug test, even if they have a prescription for medical marijuana use, does not have a case for discrimination against the employer because the Statute that governs the Florida Drug Free workplace still prohibits use of any drugs scheduled as Class One by the Federal government.. Of course this will be eventually be played out in courts and the possibility remains that the courts could at some time rule in favor of employees – especially as the opioid epidemic worsens and more and more states are looking to medical marijuana as a better alternative to chronic pain relief. 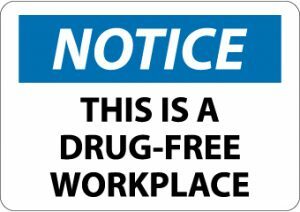 Until that time, the statute is clear that marijuana use, medical or otherwise, is not permitted under the Florida Drug Free Workplace rules. Florida’s Office of Insurance Regulation has approved a statewide average rate decrease of 9.5% and premium decrease of 9.8%. This applies to both new and renewal workers’ compensation insurance policies effective in Florida as of January 1, 2018. Click here for a comprehensive list of the new rates by classification. Click here to read the official release from the Office of Insurance Regulation. Click here to read the final order on the rate filing. Update! OSHA extends deadline to December 15, 2017. Reminder, employers are required to submit their completed 2016 300A form electronically to OSHA by December 1, 2017. Two categories of employers must submit information from their injury records. Employers with 250 or more employees, at any time during the year – Starting in 2018, these employers will be required to submit the previous year’s OSHA forms 300A, 300, and 301 once per year. Employers with 20 or more, but fewer than 250 employees, at any time during the year, and the business operates in one of OSHAs predetermined high-hazard industries – Continuing on in 2018, these employers will be required to submit the previous year’s OSHA form 300A once per year. Employers not falling in one of the two above categories, must submit information only if OSHA notifies them to do so, but are still required to complete and maintain the information on-site annually (unless otherwise exempt from the recordkeeping requirement). The high-hazard industries include construction, landscape (other than design), manufacturing, wholesale trade, utilities, agriculture, grocery and department stores, many types of residential health-care facilities, freight trucking and warehousing. 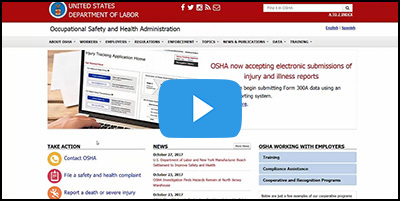 Gulfshore Insurance’s step by step tutorial will walk you through the process to electronically submit your 300A forms for 2016 injury and illness data online via the OSHA Injury Tracking Application. For more information on the new recordkeeping rule, click here.